FACT CHECK: Did Pope Francis Say It Was Better to Be an Atheist Than a Bad Catholic? 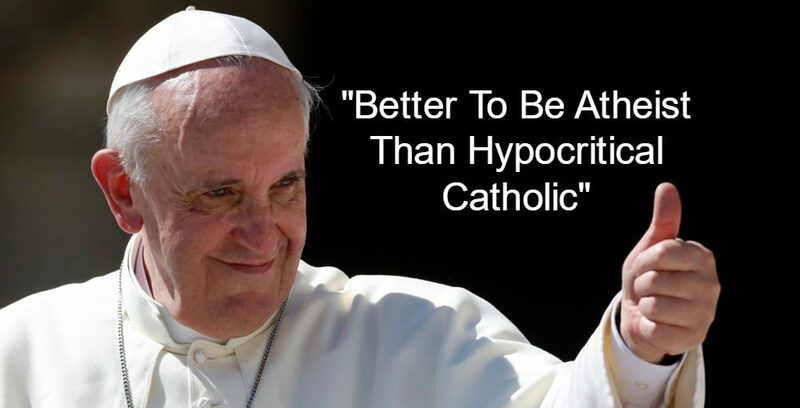 Did Pope Francis Say It Was Better to Be an Atheist Than a Bad Catholic? Versions of a remark Pope Francis made about atheists and Catholics were misleadingly paraphrased. This translation, provided by the Vatican Radio, makes it clear that the Pope didn’t directly say that it was better to be an atheist than a “bad” (or “greedy” or “hypocritical”) Catholic or Christian. Rather, the Pope was repeating a common phrase commenting on Catholics who conduct their lives in ways contrary to their faith. The Washington Post. 23 February 2017.